On the Pacific coast of Nicaragua there exists a strong a vibrant cultural and folklore tradition which is a source of great pride in their country for its people. Culture in Nicaragua is a fundamental pillar of education and by linking cultural activities into education it becomes possible to promote literacy, self-esteem and social and environmental awareness. One of the most colourful and engaging traditions of Nicaragua exists in the city ‘León Santiago de los Caballeros’, a colonial city founded by the Spanish on the North west pacific coast of that country. 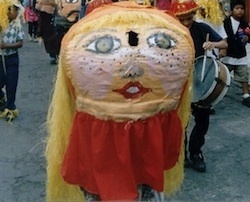 There can be can be found Gigantonas (female giants) and Enanos Cabezones (Big-headed Dwarves), processional figures that are a result of the mixing of indigenous and Spanish cultures. The Gigantona is a giant puppet figure representing the Spanish lady in all her power and splendour and majesty, her imposing stature demonstrating the power of the Spanish over the indigenous peoples. In construction the Gigantona has a carved wooden head mounted on a substantial cross beam from which wooden struts radiate downwards leaving space for the gigantonero. By comparison the Enano is made with a 3 foot diameter head formed from bamboo or willow covered in painted cloth. Below the head comes a short body and legs where a shoulder frame and suit disguise the bearer. 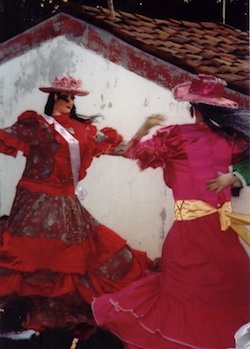 Typical of the groups engaged in supporting this tradition is the youth group Viva León Jodido. This group is based in the indidgenous quarter of Sutiaba and celebrates the cultural traditions of the city through processions of the Gigantona. Children participating in these events create their own dance routines and prepare couplets which can be recited on the day of a public performance. The Enano Cabezón in turn represents the indigenous people, short in stature, it’s large head signifying that despite the imposition of foreign power by colonisers that the local people are intelligent, capable of developing themselves as individuals as well as their country.